The title of this post is from a song that I love. MercyMe’s song “The Hurt and the Healer” talks about loss and not understanding. It talks about the only healing coming from the Lord. I believe in that from the top of my head to the bottom of my feet. I believe it because I have lived it. Ten years ago today I lost my dad. He had struggled with kidney failure for 2.5 years but his death was very sudden. He succumbed to congestive heart failure, a complication of the kidney failure. I was devastated. He was 46 and I was 22. I never expected to bury my dad before I had children, before he retired, before he got to finish living his life. Following his death I went through a period of depression, which is normal but so very different than my everyday personality. I wasn’t sleeping and very little of life brought me joy at that time. I know without a shadow of a doubt that my faith brought me out of that time and helped me want to live life to the fullest again. I still miss my dad every day. 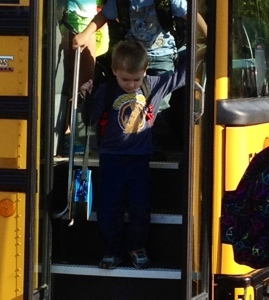 I look at my children and grieve because he would have loved them so very much. 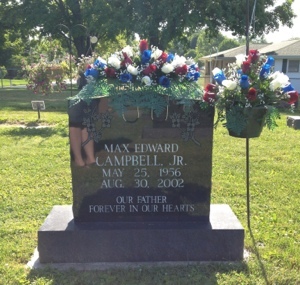 I know that they would have had a blast with their papaw Max and I hate that they have missed out on that. 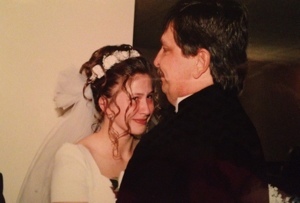 One of my very best memories of my dad is on my wedding day. 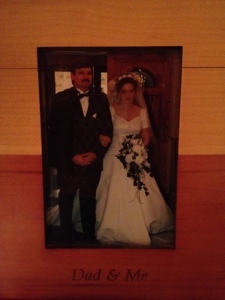 I have a picture* in our dining room of him walking me down the aisle. I love this picture. It really was a beautiful moment. I’m glad I have this but it’s another picture*, one that’s not in a frame, that truly captured the emotion of the day. I almost cry every time I see this photo. Our photographer somehow caught this moment, raw with emotion and so quickly fleeting. To others it might mean nothing more than an “ugly cry” in a picture. To me it means the world. Our ceremony was over and we were greeting people. There was laughing and congratulations. It really was a happy time. When it was my dad’s turn he wrapped me up in his big arms and told me how much he loved me. He choked back tears and that’s all I could take. I cried as I hugged my dad, knowing he didn’t want to let his baby girl go. As he let go the photographer caught my face and a glimpse into a deeply personal moment between a father and daughter and for that I will forever be grateful. Today, ten years after his loss, the breath still catches in my throat at times and I can’t believe so much time has passed since I saw him last. I still go to visit him but it’s here. I know this isn’t really where he is but the dad that I knew, the body that I hugged, is there. It gives me comfort when I know I can be just a little bit close to that body again. I’m sad today and having a hard time but I’m thankful I had my dad for 22 years. He was a good man and a good dad. I love you dad. *Please ignore the quality of the first two photos. I didn’t have the energy to scan them so I took a pic with my phone. I know it’s not the best but it’s what I could offer today. Monday will mark the official start of my second year of nursing school. I haven’t talked about it a lot here but I am currently in the middle of my Associate of Science in Nursing (ASN) program. One year left and I will be eligible to take the National Council Licensure Examination (NCLEX) to officially become a registered nurse. With less than a year left (really only NINE months – WOO HOO!) it actually feels like this goal is in sight. The next two semesters are not going to be easy but it doesn’t feel as overwhelming as it did last year. Last year it felt like I was flying blind and felt like I was learning a whole new language. Now it feels like I have the basics and just have to build on them. I was looking through my old notes (yes, I keep all my old notes and just about everything else and it drives my husband INSANE – love you babe!) 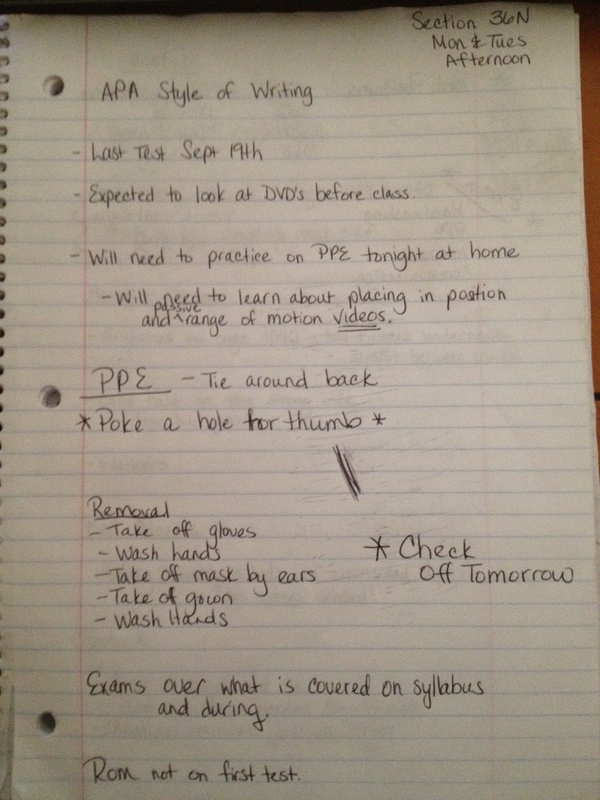 this week and came across things I wrote down on the first day of class. These may not mean anything to anyone else but to me these are a victory. I have conquered APA style (I still don’t like it but I can ROCK it) and have no problem writing anything in this format. I know what PPE (personal protective equipment) is, how to use it, how to remove it, and the rationale behind it. ROM (range of motion) seemed scary and intimidating and now I could do ROM exercises on any patient that needed them. I passed every “check off” (completing an assigned procedure in front of an instructor) on my first try and would feel comfortable trying anything from a catheter removal to starting an IV (I did get to do both by the second semester and couldn’t have been happier). The first day of class felt like I was looking at a mountain that I might never get over. It was intimidating and overwhelming. Now I look back at how far I have come and I’m proud. I can’t say that the mountain didn’t knock me down a few times (there have been very real breakdowns in the hallway after a test) and send me sliding down just when I thought I was making headway. I can say that looking up the mountain doesn’t seem nearly as high and that I know I will make it to the summit before I know it. If any new nursing students or prospective students come across this blog please keep your head up, even when you get knocked down a little, and know that if you keep going that you will have your victories too. 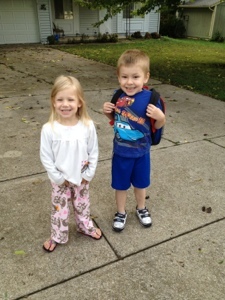 Livi prefers to wear pajamas while joining Aiden at the bus stop. I would too if I didn’t think I would look like one of “those mothers”. LOL. Well, I was planning to do a “Thrifty Thursday” but tonight we had Aiden’s open house and when we got home the power was out. It hasn’t rained all summer and tonight it’s raining buckets. Now we’re at Gabe’s fabulous sister’s house and getting pizza to pass the time. Yep, we invaded her house. 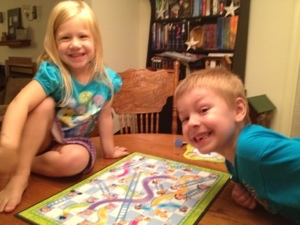 So, instead of modest money issues I’m going to share pics of my adorable kiddos. Enjoy! Livi makes all her own fashion choices and I did not have a say in this at all. 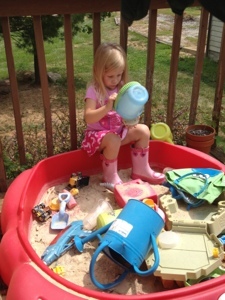 To be clear, it was a beautifully sunny day when she insisted on wearing her rain boots. So last week we went to church camp with our church’s young people and the two kiddos. We had a fabulous time filled with friends, food, and fellowship. Not only that but we got to try a few things we hadn’t before and have some neat adventures. That being said, I’m a little battered and bruised from all the fun. It started with a giant swing. You read that right. You get completely harnessed in for safety, including a helmet (although the helmet is not pictured here). Once you are safely fastened to the structure you are then hoisted up very high in the air until you reach the top. This is adventure by choice so you have to pull the release yourself (or make your husband do it if you’re a big weenie – thanks babe! He he). You free fall until the line catches you, then you swing back and forth until you slow down and are unhooked. This is the structure. There is actually another one across from it and you swing toward another couple of people. If you know me, then you know that I couldn’t do anything 100% normally like every other person out there. From the time I sat down I never felt good about where I was in the seat. When we were pulled up I felt too far back and like I was off balance. The countdown ended and Gabe pulled the release. I found out that I am not a screamer in a free fall situation, I’m a teeth clenching grimacer. We hit the bottom and started the upward swing, which definitely felt better. That is until I fell off the back of the swing. I FELL OFF THE BACK OF THE SWING. Please reference the video to see my feet in the air and my head upside down. Upside down. That was an adventure to put it mildly. After letting my stomach and nerves calm down, as well as eating a little lunch, it was time for another new experience. Next up was the zip line. I wish I had gotten more pics of it or some of us on it but I didn’t want to take my phone out in the woods for fear of dropping it. To say it was AMAZING is putting it mildly. We had to hike out through the woods in to a field. 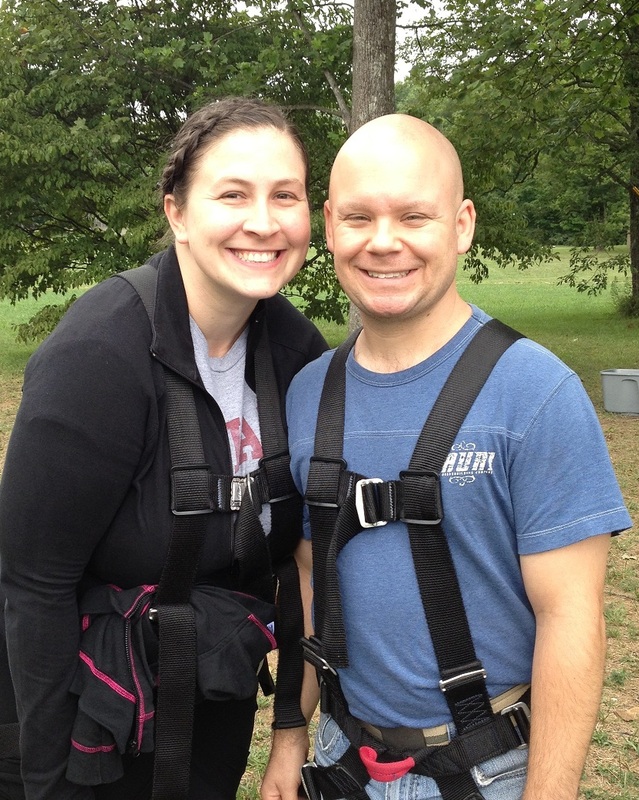 We then got harnessed up again (see the above picture!) 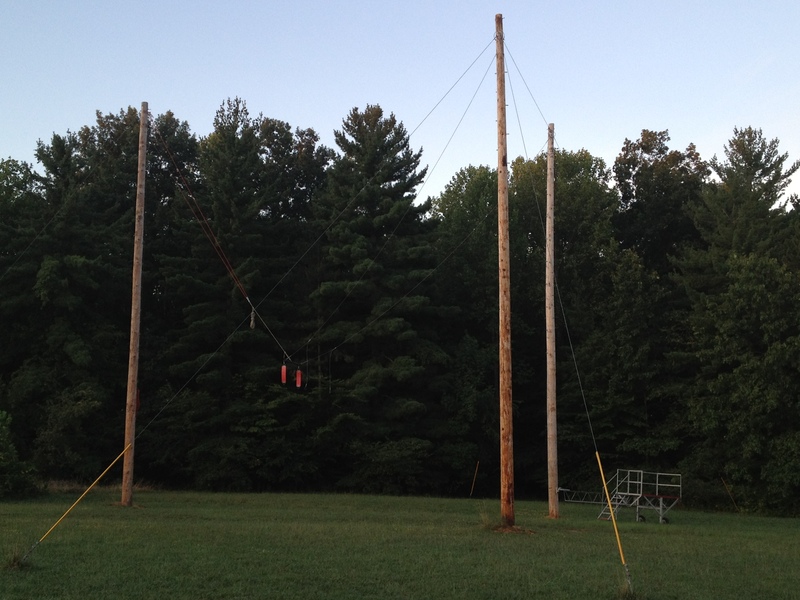 and had to climb a large telephone pole up about 30 feet. Once up there we were harnessed to the zip line and just had to sit down and let go to swing high above our friends and end up back at camp. This is a picture taken at the stopping point. 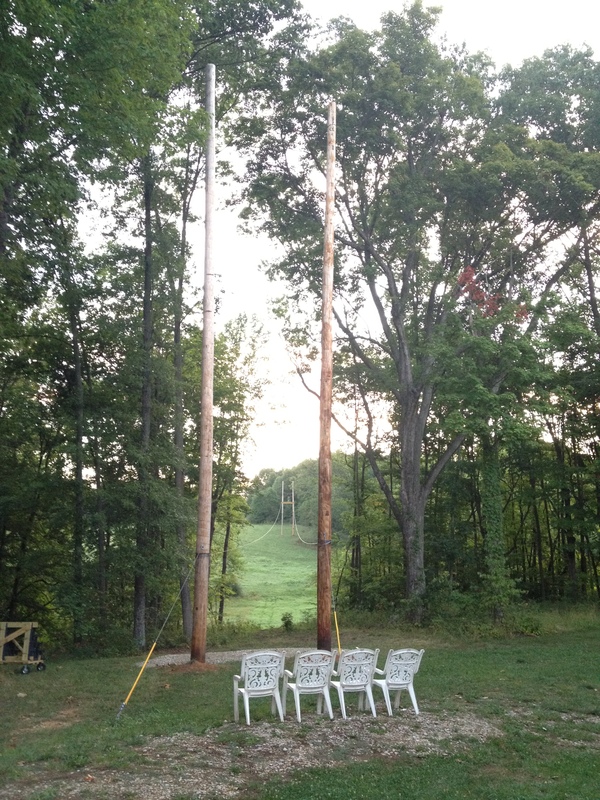 If you look off through the two poles you can see another two poles and a platform out in the distance. That’s what we zipped off of to end up here. I liked the zip lining SO much better than the swing for a lot of reasons. I would have gone right back out and done it again if we had had the chance. It was really neat to be so far up and just zoom right down. All these adventures did come at a price. Now to tie this all in to my title. 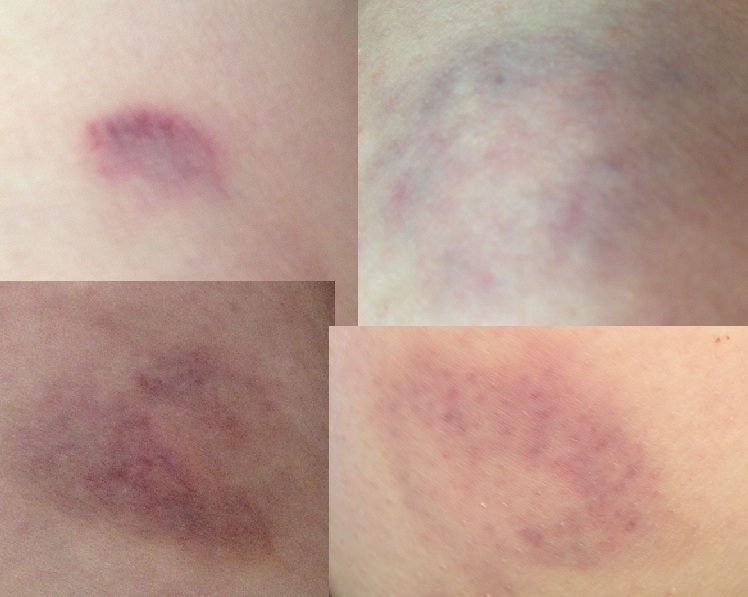 After camp was over I started noticing a few bruises on my body and within about a day I realized I was covered. Here is a collage of just a few. Aren’t they pretty? Yep, every one of these came during our adventures at camp and they were all worth it. I’m battered and bruised but I had FUN! 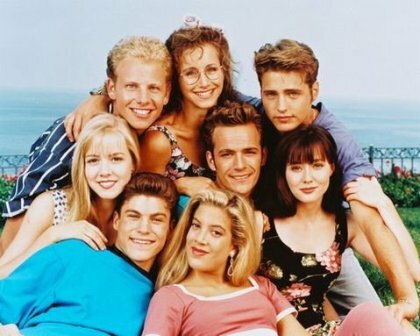 Okay, I have to admit, I am a HUGE “Beverly Hills 90210” fan. And I’m not talking about that new thing out there. I’m talking about the Brandon, Brenda, Kelly, Dylan, Steve, Andrea, Donna, and David original. I can’t help it. Don’t judge me. This show started just as I was on the cusp of becoming a teenager and it kept me company throughout my teen years. I remember discussing the SHOCKER episode of Dylan’s father being blown up the next day on the bus. I remember being so upset when Kelly told Brandon no the first time he asked her to marry him. It was all so good! I would still watch reruns if I could find them on and have definitely watched a marathon before when it was shown. That’s why I was super happy to see this commercial hit the airwaves. As a rule I do NOT like commercials. I tend to read or do other things while commercials are on and basically avoid them whenever I can. The other night I happened to catch one that just made me smile.